The Rockets really seem to want Jimmy Butler... but can they get him? Several reports have indicated that the Houston Rockets have offered 4 first round picks for Jimmy Butler. Although that is quite a haul, I don't think it is enough. Remember that time Jimmy Butler was happy in Minnesota? Some may see this and say, "Those picks are all going to be somewhere between 25 and 30. Those have almost no value". However, due to NBA rules, no team can trade consecutive picks. Therefore the picks would be most likely from 2019, 2021, 2023, and 2025. The first two should be extremely low. But let's look at 2023 and 2025. By then, Chris Paul will either be retired or a walking corpse. Harden and Butler will 34 in 2023. They will have a ton of miles on them. The Rockets won't have any influx of drafted talent and they will have no cap space. Those two picks could be extremely valuable. Unfortunately for the Rockets, Tom Thibodeau, the GM and coach of the T-Wolves, does not care about 2023 and 2025. He wants to compete now. In fact, his head may actually explode if he is not competitive every single second of every single game. The only hope for the Rockets is to get a third team involved. It can't be just any team. It must be a team willing to rebuild and take on bad contracts. They also must have veteran players good enough to entice Thibodeau to send away his man crush. 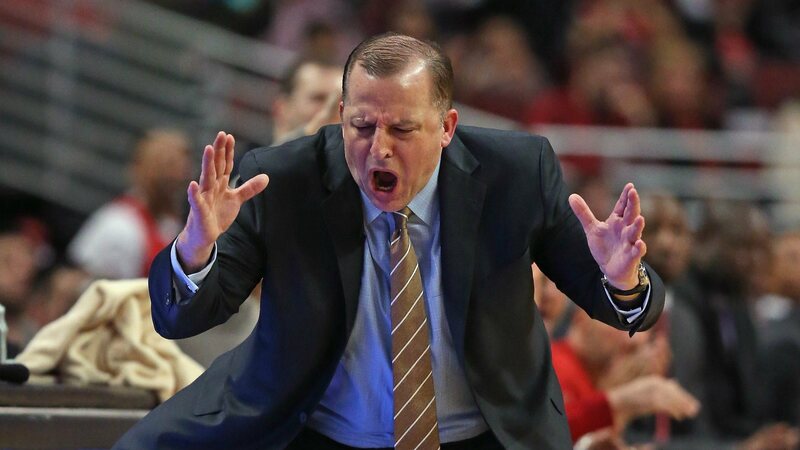 How much do you think Thibodeau sweats when he eats? In the East, the re-builders are Magic, Bulls, Knicks, Hawks, and Cavs. In the West it should be everyone not named The Warriors and The Rockets. In reality, it is the Suns, Kings, Clippers and perhaps the Grizzlies. Let's assume the Rockets will not give up Eric Gordon. That means in order to match Butler's incoming salary, the most likely trade pieces would be Brandon Knight and P.J. Tucker. Thibs is not making that deal. He's going to need a stud or two with a combined salary of around $20 million. I can't see Thibs trading away the love of his basketball life for any of those guys except perhaps Gasol if he also comes equipped with a time machine. Ultimately, T-Wolves owner Glen Taylor may step in and go for those 2023 and 2025 picks... but good luck living with Thibs if he does. Anybody out there have a deal that could actually work?